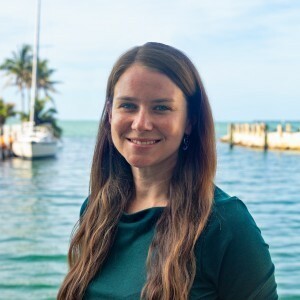 Dr. Clark joined the Mote Marine Laboratory in early 2018 after completing her dissertation on lobster disease ecology at the University of Florida. It was here that she developed a TaqMan real-time quantitative PCR (qPCR) assay for detecting, and measuring levels of, Panulirus argus Virus 1 (PaV1) in Caribbean spiny lobsters. Using qPCR, she answered a series of questions investigating the interactions between PaV1, its host, and the environment. Similar techniques used to study PaV1 will now be employed to examine the disease ecology of corals. Clark, A.S., Jury, S.H., Goldstein, J.S., Langley, T.G., Watson, W.H. 2018. Underwater video surveillance of American lobsters (Homarus americanus) to understand saturation levels in lobster traps. Fish. Bull. 161(2), 161–170. Clark, A.S., Behringer, D.C., Small, J.M., Waltzek, T.B. 2018. Partial validation of a TaqMan real-time quantitative PCR assay for the detection of Panulirus argus virus 1. Dis. Aquat. Org. 129(3), 193–198. Watson, W., Morrissey, E., Sykes, S., Clark, A., Jury, S. 2018. Experimental analyses of the mechanisms leading to lobster (Homarus americanus) ventless trap saturation. In Review. Clark, A.S., Behringer, D.C. 2017. Sponges and the spatial epidemiology of Panulirus argus Virus 1 (PaV1) in Caribbean spiny lobsters throughout the Florida Keys. Proceedings of the 69th Gulf and Caribbean Fisheries Institute. 274–275. Clark, A.S. 2017. Pathogen, host, and environmental dynamics: a case study of Panulirus argus Virus 1 in Caribbean spiny lobsters. PhD Dissertation. University of Florida, Gainesville. 112 pp. Clark, A.S., Jury, S.H., Goldstein, J.S., Langley, T.G., Watson, W.H. 2015. A comparison of American lobster size structure and abundance using standard and ventless traps. Fish. Res. 167, 243–251. Clark, A.S. 2012. A comparison of standard and ventless American lobster trap dynamics. M.S. Thesis. University of New Hampshire, Durham. 81 pp.